Protein-Packed Funfetti Cupcakes That Build Muscle! Looking for something to satisfy your sweet tooth? Treat yourself to this good-for-you cupcake that’s low in sugar, high in protein, and packed with flavor! You may not believe me until you make them for yourself, but these protein cupcakes taste just like cake batter. 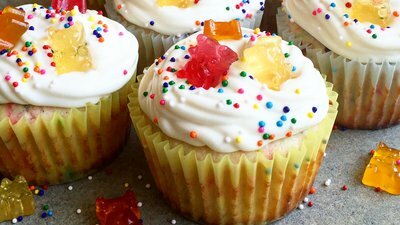 They’re ridiculously moist, smothered in creamy frosting, and topped with sweet gummy bears. Each 117-calorie cupcake contains only three grams of sugar and is packed with 12 grams of muscle-building protein. How can this be? You can thank the delicious flavor of Jamie Eason Lean Body for Her Whey Isolate in Natural Vanilla, and these fiber-filled (virtually sugar-free!) gummy bears from Smart Sweets. If you’ve made my recipes before, you already know how much I love Jamie’s all-natural protein powders, but these gummies are new to my kitchen. They’re made from tapioca fiber, stevia, coconut oil, and real fruit flavors, and they’re delicious. If you don't have coconut flour on hand, you can use 6 tablespoons oat flour, all-purpose flour, cake flour, or gluten-free baking blend. You can also substitute the Stevia blend with 6 tablespoons granulated sugar, and 4 tablespoons Stevia or sugar can be used in place of the erythritol. Next time you need something sweet, do yourself a favor and make these incredible cupcakes—and try your best to save one for a friend!